& the Beliefs of an Ex Meth Addict. His letters are in yellow, whilst mine are in black & white. So, I'm walkin' up Avenue A this morning and this guy comes up behind me, laughing and commenting on how much he loves my tattoos and wants to know if I'm a Bright. And I'm like, "A what?" And he repeats himself in his English accent, "A Bright! A Bright!" And I realize that this is the second time in as many days that I've heard mention of whoever this may be. My first reaction was "Oh great! Now we're like The Moonies, The Raliens and The Sunnies [ref: Soap]!" And then after hearing a brief description of what they were about I said "Hippy atheists!" And I trotted on my merry way to Alt Coffee to Google "The Brights" and see what the hell was going on. As it turns out, The Brights are all inclusive, even if you're religious! Just as long as you don't believe in the Supernatural aspects of your religion. So if you worship Jesus Christ, and believe in the Bible, just as long as you don't subscribe to any of the magic and miracles, you can be a Bright! I'd be very interested to meet the Christian who doesn't buy into any of the magic stories from the Bible (the resurrection, virgin birth, Creationism, etc) and could consider him/herself a Bright. Their symbolism is "Light! – clear and vivid!" Positive Atheism without all the negativity. Personally I really liked that episode of Southpark where, in the future, Atheists go to war with each other because now that everyone agrees on religion, they need to argue about something else, so it's over what to call themselves. And right now I am having very little trouble picturing our future-selves, Atheists vs Brights, covering opposite sides of the globe, armed to the nines, and the well-being of all mankind hanging by a string. So who is the leader of the Brights? Paul Geisert, who first coined the noun, "Bright." He is now Co-Director of The Brights, Mynga Futrell, who developed the definition and joined with Paul to design/implement strategy for a brights movement, and Kevin Schultz who came on board the movement as Webmaster of this site. And they're all from Sacramento CA. Need I say more? I hope that your day has been blessed! You are a talented artist...you're just using your gift the wrong way! I pray for you, but I am not like some of these other religious people that send you all this "hate mail" as you call it. I hate religion...it is the root of the disease that plagues the church of America. I live in the heart of the Bible belt, and sometimes it disgusts me to see people act like they are perfect and "holy". What we really need to see is that we are human, and we are nothing without Jesus in our lives. I read where you said that people shoved religion down your throat when you were younger...but if you read about Jesus, you'll see that He never did that to anyone! He is the definition of LOVE, and I pray that God would reveal His love for you, to you! Remember, you, Normal Bob Smith, are really in my prayers! I think it's horrible to look at people as being "nothing without Jesus." This sort of mindset (however you intended to phrase it) actually sets you further away from seeing that we are all human, and puts you closer to seeing believers in Jesus as more important and more valuable than everyone else. The reason your belief in Jesus is so harmful is because it immediately places a value on an individual. You shouldn't be doing that, and it's sort of disturbing to me that your email claims that you see us all as human (as equals), then you completely contradict yourself by not including people of other beliefs. I'm guessing you're sorta forced to pretend people of other beliefs are less valuable, otherwise how could you be expected to relish your afterlife in heaven while they suffer in hell? Thank you for your email. It was kinda scary. Thanks for your rapid reply! I hope that you find joy in the fact that I didn't have any typing mistakes...(I think it's funny!) I know that you look at my email as me trying to disprove your belief. That's not what I am doing. I didn't send you an email to have you put it on your site...I just wanted you to know that Jesus is what makes me full of life. He wants to do the same for you. I don't think that believers in Jesus are any more valuable than those who don't claim to be a follower of Him...heck, Satan BELIEVES in Jesus, but he doesn't follow Him. God sees all of us, as desires for us to be with Him, in Heaven, for eternity. That's why Jesus died...not for us to take our "eternal security" and live as hypocrites...but to have fullness of joy, and peace, and love. I apologize to you if you thought that I was putting a value on people for their beliefs. God desires us all...no matter who we are, or where we've been, or what we've done. HE STILL LOVES US! Telling yourself that God desires and loves us all whilst he let's open a doorway for us to fall forever into eternal suffering doesn't compute. It's a flawed concept. It is clearly an idea invented by man, because no loving God could let his children burn forever without rescue, nor could he expect his other children to enjoy paradise while their brothers burn. Even if we hate our father he still wishes the best for us and would save us from eternal melting over red hot cinders. It's just so obviously a pretend story that doesn't work out when you actually think about it. Go ahead and believe it if you want, but it's pretend. Sorry. Have you ever thought it through, or do you just want it to be true so badly that you ignore the flaws? Good morning! I hope all is well with you. When I read your email this morning, I was wondering...if there is NO God...then how did all of "this" (our existence) begin? What gives you life? I am a little surprised that you completely disregarded the problems I brought up in my last email but at the same time you are so anxious to discuss? I am an atheist, Landon. That means I don't believe there is any God, afterlife or spirit world. It's pretty much the same thing you believe about the other living things on this planet (birds, dogs, fish, plants, insects, etc). They also have no afterlife, no animal version of god, and no animal ghosts. I believe in Evolution, and I also believe that science will probably find answers to these other questions you've asked of me. But because it has yet to doesn't incline me to leap to my own conclusions and imagine a great planet-making wizard in outer space engineering the cosmos. 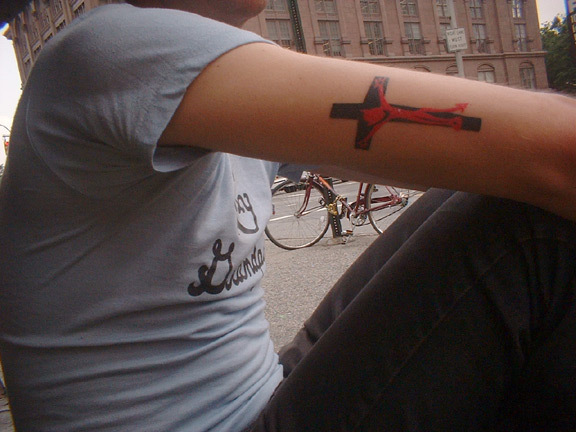 The cross tattoos are of a crucified Satan. Here's a better picture of one of them. See now that they are not just crosses? They are just sarcasm to me. "Crucify the Devil!" That's my funny way of expressing my atheism. Now, if you could, please answer the questions from my previous letter. That would be nice. Otherwise, I would hate for you to upset me and make me have to EXPLOIT you! Haha, I am joking. You're a funny guy! OK, to respond to your "problems" that you brought up in your earlier letter...here goes! God, from the beginning of time as we can understand it, has given the human race the gift of free will. Even the angels have free will. We know this because when the Bible tells about the fall of Lucifer, it says that 1/3 of the angels went with him. So that means that 2/3's of the angels stayed with God in Heaven. That shows free will. Now with us, humans, look at Adam and Eve in the garden of Eden. They walked with God daily in the garden, and knew Him like no other did. But Eve, chose to eat of the fruit that was forbidden to eat, and Adam followed suit, and did the same...that shows free will. In the same way, God gives us free will. If God could make you a garden paradise of your own, and everything was perfect in it, would you want to mess it up? Heck no...but you could chose to mess it up if you wanted to! See, that is why some will, unfortunately, die and spend eternity in Hell. Not because God wants them to, it's because they chose to! Who in their right mind would really chose that for their eternity? It's about choice...not dictatorship! Some look to God and say, "He is this invisible ruler who tells me everything that I can't do!" But in actuality, God is wanting us to chose Him, so He can show us all he has for us to do! That is the exciting part. Whether you believe it or not, Bob, God gave you your talents and gifts. He gave you your breath that you are breathing right now. Science can't give you answers to life's mysteries, but give God the chance to answer your questions...and He will! You seem like a very intellectual person. But for someone who believes so much that there is no God...why is He so much of what you talk about? It seems to me that you want to believe in something...but you want truth to believe in. It says in God's word, "If you seek me, you will find me if you seek me with all of your heart." He wants me & you, He desires me & you, He sent Jesus, and Jesus died for me & you - He doesn't want us to spend an eternity in Hell - but we have to chose! I look forward to hearing from you! Wait, now this letter from you has many MANY contradictions in it, and many things that simply aren't true. People don't choose to go to hell. They don't choose to not follow your God, or whatever it is you're saying. Many people don't follow your religion simply because they have never heard of it, or know anything about it. You go over to China, or the Middle East and you'll happen across a whole lotta people who've just never heard about all your Christian beliefs. There are also people who don't believe in your God because science has indeed answered many of life's mysteries, curing diseases, feeding people, microchips, prolonging human life span, artificial limbs, agriculture, healthcare, telescopes, nail clippers, cigarette lighters, robots, and even the Internet which is how we're communicating right now! Science has solved many MANY mysteries! How can you say "Science can't give you answers to life's mysteries?" Of course it can! In fact, without science's answers you probably wouldn't be alive today with the luxury of contemplating life's mysteries in the first place! Saying things like "Science can't give you answers to life's mysteries" makes me think that you are trying to deceive me, and rope me into a world of foolishness. It's really hard to read your email and not think you're living in a world of foolishness. You think there's a choice when one of the two options is eternal suffering? That's the exact opposite of free choice. When a dictator like Hitler makes his rules he also gives the people he's dictating a choice of bowing to him or suffering and death. Actual free choice is when the leader allows you to not follow him with no penalty of suffering, punishment or execution. You act like you don't even understand what free choice means. It's chilling to think you're so eager to serve such an idea, and spread it to others. Landon, your thinking is extremely strange and difficult to follow. In fact, your type of thinking is precisely the sort of thinking that falls squarely with those who'd allow a dictator to come to power. You know full well that people don't say "God or Hell? I choose Hell!" But you tell yourself that's their choice so that you don't have to think about them suffering and choking and being hauled off in the boxcars to the camps. It puts shivers up my spine to see you so open to the concept of a "free choice" with eternal suffering for those who don't choose correctly. I sure hope your Christian idea of "freedom of choice" doesn't spread far. That much suffering and pain inflicted on a mass of people who think differently really terrifies me to the point where I would have trouble sleeping at night. God, please stop believing what you do. It's like a horror movie! Hey man! I'm glad to hear from you again...I thought for a minute that you were gonna blow me off, and not reply back. There were no contradictions in my last email...just conflictions! To be contradicting, I would have to say one thing that is totally opposite from another point that I was trying to make at the same time. But see, CONFLICTION would be a better word...My views conflict with yours. But that's OK! There is still hope for our new found friendship...right? Our knowledge of everything had to come from somewhere. If it has evolved, then why is the earth still in so much turmoil? Wouldn't we have evolved into a peaceful, loving society? Not one bent on crime, and hate, and envy and greed? It all comes down to choice. People do chose their fate of eternity because they don't chose the only source of real life. The real life is only found through Jesus Christ of Nazareth! Man, I know this because of my life's journey. You see, 4 years ago I was addicted to Meth...But, I was raised in church my whole life. See, like you I have been fed religious junk too! But, it wasn't until God radically changed my life and delivered me from Meth that I saw Him as the lover of my soul that He really is. I chose to be addicted...but when I cried for Him to be real in my life...He was there with open arms! I haven't been the same since! My God isn't a dictator Bob...He is the lover of your soul too! He wants you to spend eternity with Him. But you have to choose that for yourself. Bob! Jesus died for you! He loves you more than you could ever possibly fathom! I know that when you read my letters, you probably laugh and wonder why or how I could believe the way that I do...it's because of conflict. I pray for you daily! Ahhhhhhhhhh, you're an ex Meth addict! Got it. That clears up the whole works. Now I understand why it's not a direct contradiction to say "I offer you freedom of choice, but the only other option is pain, suffering and death," Or "My God isn't a dictator!" Not a contradiction. I get it now. I also now understand how you think the world hasn't become a better place in the last 100, 500, 2,000 years. And the reason you think it was safer to walk the streets, eat the food, be black, atheist, gay, female, feverish, hungry, non virgin a millennium ago. Your story is getting more clear and your illogical theories are suddenly becoming more understandable. I'm also understanding now why you need the huge parent in the sky hugging you, and how His presence in your life now is so necessary. The mere mention of your addiction to Methamphetamines and a lifetime of church has radically altered my impression of you. I'm sorry, but it's now unalterably difficult for me to take your perception of reality seriously, especially if your belief in all this garbage was so emotionally driven. Landon, in my time on this planet I have found that when a person makes a decision based on such strong emotion, these emotions are a completely undependable resource for determining the truth of the matter. You see, Landon, I would never do something as foolish as becoming a Meth addict. I hardly drink, I don't smoke or party. I'm a pretty conservative person, and keeping a clear mind is extremely important to me. The last thing I'd do is switch over and, without any evidence or logical explanation, go ahead and start believing in angels and devils battling it out over my living soul, and a dreamland of prizes waiting for me in the sky. Sorry, Landon. If you were a dear friend or family member perhaps I'd take a bit more care in the wording, but frankly I just don't trust your perception of reality. I understand that you're completely emotionally attached to these concepts you're sharing with me, but that's the precise reason I don't believe you're capable of examining them objectively. Good luck with the addiction problems and the daily correspondences you're having with the Supreme Being about my disbelief. My final advice to you would be to never ever do drugs ever again, and recognize your addictive personality so that if you ever find yourself obsessing over anything ever again (ahem! Jesus –*cough cough*), address the issue, and understand it is not healthy to worship anything. Anything! Email me if you would like more advice. I'm happy to give it.